Perhaps taking their cues from Riff Raff’s “how to stay semi-relevant” playbook, Ninja and Yo-Landi Visser of Die Antwoord are pissed at Suicide Squad director David Ayer for “jockin” their group style. The aforementioned Riff Raff was once (maybe still is?) angry that James Franco borrowed his terrible aesthetic for his performance as Alien in Spring Breakers. Now, Ninja and Yo-Landi are livid about various elements of the critically reviled DC movie. Yolandi posted her grievances to Instagram in the form of a video slideshow featuring apparent evidence of the similarities. The examples? Jared Leto’s Joker, like Ninja, is tattooed and often shirtless. Margot Robbie’s Harley Quinn, like Yolandi, wears a bunch of watches. 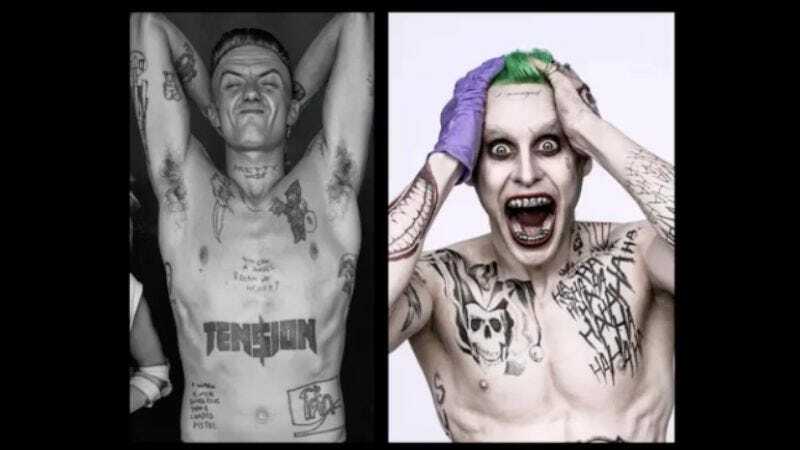 The Ninja comparison seems like a far more legitimate gripe, even though the video also pairs an image of the Joker next to one of Marilyn Manson, which would seem to imply that Die Antwoord does not have exclusive rights to that look. We’re unclear what the exact problem is. Was Ayer not explicit enough about using them as inspiration? Are they distressed because they weren’t credited? Are they offended because the movie is bad? (Same here.) Or are they just still reeling from the fact that Chappie was such a debacle?